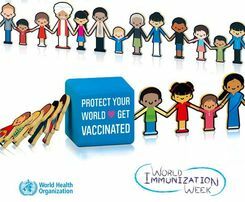 World Immunisation Week aims to promote one of the world’s most powerful tools for health – the use of vaccines to protect, or immunise people of all ages against disease. Immunisation is one of the most successful and cost-effective health interventions and prevents between 2 and 3 million deaths every year. From infants to seniors, immunisation protects against diseases such as diphtheria, measles, pertussis (whooping cough), pneumonia, polio, rotavirus diarrhoea, rubella and tetanus. The benefits of immunisation are increasingly being extended to adolescents and adults, providing protection against life-threatening diseases such as influenza, meningitis and cancers (cervical and liver cancers). The ultimate goal of World Immunisation Week is for more people and their communities to be protected from vaccine-preventable diseases.